A reading by Flint Taylor, followed by a panel discussion moderated by Bernardine Dohrn and featuring panelists Flint Taylor, Darrell Cannon, Mary L. Johnson, Joey L. Mogul, John Conroy, and Locke Bowman. Please stay to have your book signed following the discussion. Thirty-eight years ago, on November 3, 1979, 35 heavily armed members of the Ku Klux Klan and American Nazi Party drove nine vehicles through the city of Greensboro, North Carolina, and opened fire on a multiracial group of demonstrators who were gathering at a Black housing project in preparation for an anti-Klan march. In the most deadly 88 seconds in the history of the city, the KKK and Nazi marauders fired over 1,000 projectiles with shotguns, semi-automatic rifles and pistols, leaving five of the march leaders dead and seven other demonstrators wounded. Most of the victims were associated with the Communist Workers Party (CWP) — a militant, multiracial organization which had been organizing in the South against the Klan. The Greensboro police, the FBI and the Bureau of Alcohol, Tobacco and Firearms (ATF) were all aware of the plan to attack the march. However, no law enforcement officials were present except for a police informant-provocateur, Edward Dawson, who led the caravan into the housing project, and his control agent, Jerry “Rooster” Cooper, a Greensboro intelligence detective who followed the caravan and reported on its progress to the Greensboro police. Four television crews were on hand and captured the attack on video. On June 20, 2016, People’s Law Office attorney and NLG Puerto Rico Subcommittee Co-Chair Jan Susler made the presentation to the United Nations Decolonization Committee on behalf of the National Lawyers Guild. Chicago, IL; October 14, 2015 –At the request of the Office of the Special State’s Attorney for Cook County, today Cook County Judge Thomas Byrne dismissed all charges against Shawn Whirl, a torture victim from Jon Burge’s notorious reign of terror at the Chicago Police Department. Mr. Whirl’s 1991 murder conviction was overturned by a unanimous Illinois appellate court in August of this year. Mr. Whirl will be released sometime midday today from Hill Correctional Center in Galesburg, Illinois. 46 year-old Mr. Whirl was the first person granted a new trial after a referral by the Illinois Torture Inquiry & Relief Commission, which was established in 2009 to provide an avenue of relief for torture victims of the Chicago Police Department. Mr. Whirl’s case was among the first cases to be referred by the Commission to the courts. Mr. Whirl was convicted of allegedly robbing and murdering a cab driver on the City’s far South Side in 1990. Soon after the murder, police sought Mr. Whirl, who was then just 20 years old, for questioning. During his interrogation, as Whirl testified at his evidentiary hearing, he was slapped, stepped on, and subjected to racial slurs by Detective James Pienta–a protégé of Jon Burge who worked with him for 13 years and who has been accused of torture by a series of other African-American men over multiple decades. Mr. Whirl described how, when he did not cooperate with Pienta’s insistence that he confess to this crime, Detective Pienta used a set of keys to repeatedly scrape a wound on Whirl’s leg until it was bloody and raw. Pienta took the stand at Whirl’s evidentiary hearing for a new trial but declined to testify, exercising his Fifth Amendment right against self-incrimination when asked a wide ranging set of questions about his role in the pattern and practice of torture. Burge did likewise in a video that was introduced into evidence at the hearing. Because of this torture, Mr. Whirl ultimately signed a false confession in this case. He pled guilty and was sentenced to 60 years in prison. In 2012, the Illinois Torture Inquiry and Relief Commission referred Whirl’s case back to the Circuit Court of Cook County for an evidentiary hearing on his torture claim. The courts initially denied him relief, but on August 12 of this year, an Illinois Appellate Court panel vacated Whirl’s conviction. In a unanimous ruling, the panel condemned the torture of Mr. Whirl, recognized that it was part of a pattern and practice of torture under Burge, and determined that Mr. Whirl should receive a new suppression hearing and, if necessary, a new trial. That opinion explained that ​”it is impossible to conceive of how the State could prevail at a new suppression hearing with the officer alleged to have coerced a suspect’s confession invoking his privilege against self-incrimination.” The case then returned to the circuit court, where today the Office of the Special State’s Attorney, exercising its mandate to do justice in cases involving torture, moved to dismiss all charges, citing Detective Pienta’s continuing intention to exercise his Fifth Amendment rights, and conceding that they had no case without the tortured confession. Mr. 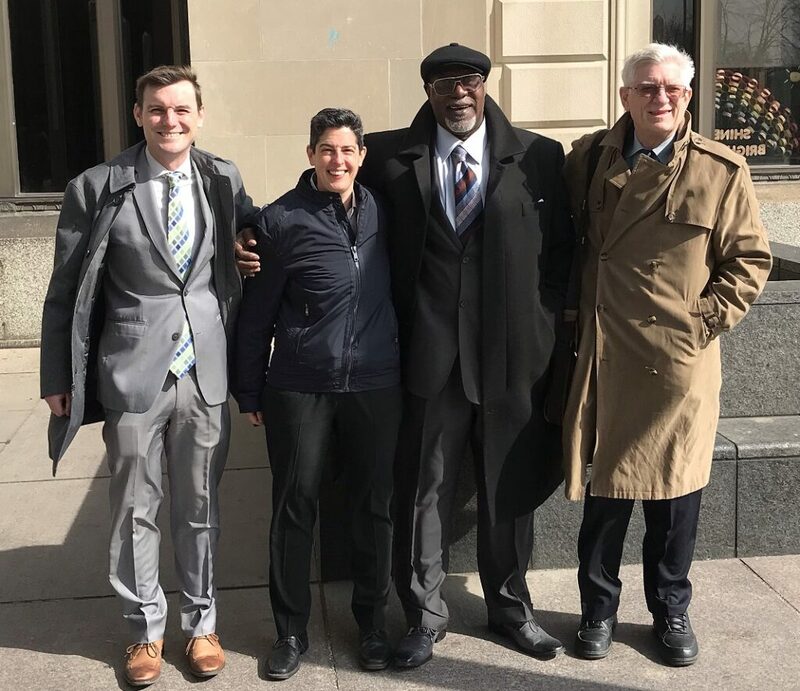 Whirl was represented by Flint Taylor, Ben Elson, and Sarah Gelsomino of the People’s Law Office and Tara Thompson of the Exoneration Project at the University of Chicago Law School. University of Chicago Law School students also participated in Mr. Whirl’s representation. Mr. Whirl and his legal team will hold a press conference on Thursday, October 15, 2015, at 1:00 pm, at the People’s Law Office, 1180 N Milwaukee Ave in Chicago. The right to financial compensation and full rehabilitation for Chicago police torture survivors who had no legal recourse was first raised in September 2005 by the Midwest Coalition for Human Rights in a submission to the UN Committee Against Torture, (CAT). The next May, Joey Mogul, an attorney at the People’s Law Office (where I work) again raised these issues to the CAT when she appeared before it. 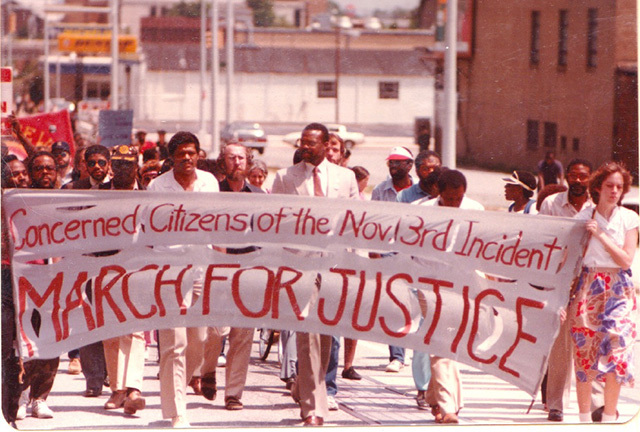 The call was taken up by Black People Against Police Torture, a grassroots organization, and its leader, attorney Standish Willis, who demanded, as part of their campaign against the 2016 Olympics being held in Chicago, that Mayor Richard M. Daley and the city of Chicago make a formal apology to all Chicago police torture survivors and provide financial compensation and psychological services to them. These demands were reasserted in a shadow report submitted in December of 2007 to the UN Committee on the Elimination of Racial Discrimination. Unfortunately, these demands got little attention in the local media. I am focused on the future of the city, not just about the past. I wanted to settle this, which is what we have done. I also wanted to see this dark chapter in the city’s history brought to a close. I think we are achieving it. And to learn the lessons from this moment so we can build a future for the city. Later in the year, CTJM presented an ambitious series of cultural and educative events on the history of torture. At this important stage of the movement for reparations, CTJM co-founder Joey Mogul, drawing on the ideas advanced during the previous several years, input from the torture survivors and community members, and relevant precepts of international law, drafted the original Reparations Ordinance. What if Mayor Emanuel, on behalf of the city and its police department, and Cook County Board President Toni Preckwinkle, on behalf of the county and the state’s attorneys’ office, stood in front of the old Area 2 “House of Screams” at 91st and Cottage Grove and issued a joint apology to all of Chicago’s citizens, together with a pledge to create a reparations fund to compensate those still-suffering survivors of Chicago police torture who were cheated out of lawsuits by the cover-up of the scandal? This fund could also be used to provide treatment for the psychological damage inflicted and for job training. Perhaps Burge and Daley’s publicly funded lawyers could be “persuaded” by the City and its taxpayers to return a healthy portion of their ill-gotten gains to help to fund this effort. Then and only then will the true healing begin. You’ve got to ‘fess up and acknowledge the difficult, problematic parts of your own history if you’re ever going to make any progress forward. Denial gets you nowhere. Refusing to acknowledge those reprehensible parts of our national or local history is self-destructive in the long run. On the heels of the apology, Mogul, relying on reparations legislation passed in other countries, revised the reparations ordinance to include further input from torture survivors, their family members and communities. The ordinance specifically called for an official apology, compensation to the survivors, tuition-free education at Chicago City Colleges for all torture survivors and their families, and a center on the South Side of Chicago that would provide psychological counseling, health care services and vocational training to those affected by law enforcement torture and abuse. Repeating the call for the $20 million fund, the ordinance also called for the Chicago Public Schools to teach about the torture cases and the city to sponsor the construction of public torture memorials. Armed with the ordinance, CTJM member Alice Kim, who had been a leader in the fight against the death penalty and police torture, met with Alderman Joe Moreno, who had a history of fighting for death row torture survivors, and solicited his support and leadership on the reparations ordinance. Moreno agreed to sponsor the ordinance and enlisted Alderman Howard Brookins, Jr., who was the chair of the City Council’s African-American caucus, to be a co-sponsor. Members of CTJM then took on the task of meeting with numerous progressive members of the council, explaining the ordinance and obtaining, one by one, their endorsement. Martha Biondi, a professor of African-American history at Northwestern University, who fought for reparations for slavery and had previously testified in support of such resolutions in City Council, played a crucial role in obtaining this important additional aldermanic support. Two of the enlisted aldermen, Joe Moore and Roderick Sawyer, joined Moreno and Brookins as strategists who provided valuable assistance to this effort. Darrell Cannon and Anthony Holmes, now joined by Marc Clements, and several mothers of imprisoned torture survivors, continued to be the face of the movement. Holmes had received nothing, while Cannon had received a paltry $3,000 settlement more than 25 years ago—before the cover-up began to unravel. In December, Amnesty, CTJM, Project NIA and We Charge Genocide led a five-mile march from police headquarters to the Mayor’s Office at City Hall, where the marchers delivered petitions signed by nearly 40,000 people, and then peacefully demonstrated in the hallway outside of his office. A few days after the Rally, Chicago Corporation Counsel Steve Patton called PLO lawyers to suggest a post-primary election meeting with CTJM representatives at which the city would present its plan for reparations. Patton—who, before becoming corporation counsel had negotiated a multi-billion dollar settlement on behalf of several leading tobacco companies—cautioned that the meeting would not take the form of negotiations, and that the city was not inclined to provide any compensation to the survivors. We responded that CTJM’s position was that compensation was a non-negotiable requirement, but CTJM decided to accept the invitation in order to learn what the City had planned and to lobby for its complete reparations package. CTJM put together a meeting team that included two PLO lawyers, a representative from BPAPT, three CTJM members and two representatives from Amnesty International. Patton headed up a group that included representatives from the mayor’s Legislative, Legal, and Human Relations Departments. The first meeting was convened shortly after Emanuel had suffered a surprising setback in the primary election, as he had not won a majority of the vote and was therefore required to face Chuy Garcia in an early April runoff. Non-financial issues were at the forefront of the initial discussions, but the team insisted that financial compensation had to be part of the legislation and continued to demand a hearing on the original ordinance. Over the course of the struggle, the movement had once again looked internationally both for support and for examples—Chile, Argentina and South Africa, to name three. The examples here in the U.S. were precious few: Japanese-Americans who were interned during World War II, the descendants of the African-American victims of the deadly 1923 race riot in Rosewood, Florida and the victims of the mass sterilizations in North Carolina. The movement was also inspired by the continuing struggle for reparations for enslaved African Americans, the movement to fully document and memorialize lynchings in the South and, most importantly, by the survivors of Chicago police torture. This originally was published in In These Times on June 26, 2015. Chicago, IL – This morning, members of Chicago Torture Justice Memorials (CTJM), Amnesty International, USA and representatives of the Mayor’s Office announced an agreement on a reparations package for survivors of torture by Chicago Police Commander Jon Burge and officers under his command before a special session of the City Council Finance Committee. The package, based on the Reparations Ordinance introduced in October of 2013 by Aldermen Proco Joe Moreno (1st Ward) and Howard Brookins (21st Ward), provides concrete redress to the torture survivors and their family members, which includes: a formal apology for the torture; specialized counseling services to the Burge torture survivors and their family members on the South side; free enrollment and job training in City Colleges for survivors and family members; a history lesson about the Burge torture cases taught in Chicago Public schools; a permanent public memorial to the survivors; and it sets aside $5.5 million for a Reparations Fund for Burge Torture Victims that will allow the Burge torture survivors with us today to receive financial compensation for the torture they endured. This historic agreement is the product of decades of organizing for justice in these cases, and represents the culmination of a concerted six-month campaign led by CTJM, Amnesty International – USA, Project NIA and We Charge Genocide, with the help of several other organizations including BYP100, Chicago Light Brigade and the Chicago Alliance Against Racism and Political Repression. The reparations package, rooted in a restorative justice framework, acknowledges the torture of Black people under former police commander Jon Burge, and begins to make amends by providing financial compensation and services to the torture survivors and their families. Beyond the financial compensation, the legislation is an important acknowledgment by the city of its responsibility to make amends for the torture, and the decades of denials and cover-ups. It is a significant step towards justice and healing, although nothing can erase the unconscionable human rights violations committed by Burge and his fellow officers. Scores of supporters of the legislation filled the City Council chambers to support the survivors of police torture. Several leaders in the movement for reparations gave testimony before the Council Finance Committee in support of the package, including torture survivors and CTJM members Anthony Holmes and Darrell Cannon, Steven Hawkins, Executive Director of Amnesty International USA; Dorothy Burge, member of CTJM and Black People Against Police Torture; Joey Mogul, co-founder of CTJM and partner at the People’s Law Office and Flint Taylor of the People’s Law Office. The Reparations Ordinance was drafted to provide redress to approximately 120 African American men and women subjected to racially-motivated torture, including electric shock, mock executions, suffocation and beatings by now former Police Commander Jon Burge and his subordinates from 1972 through 1991. Although Burge was convicted on federal charges for perjury and obstruction of justice stemming from the torture cases in 2010, he continues to draw a taxpayer funded pension, while scores of Chicago Police Torture survivors continue to suffer from the effects of the torture they endured without any compensation, assistance, or legal redress. Q: What were the roots of your civic activism? A: I didn’t really become an activist until I got to law school. I graduated [Northwestern] in ’69, right at the height of the anti-Vietnam War movement. Then I became a law clerk in the United States Court of Appeals for the 7th Circuit. The Chicago conspiracy trial was going on; these anti-war activists were put on trial for crossing state lines to encourage riots—basically to encourage demonstrations against the war. It was a very colorful trial, and the defendants were from different parts of the anti-war movement; one was a leader of the Black Panthers. I used to go down there and watch. There was this judge, Julius Hoffman, who was very against the defendants. There was a lot of commotion and a lot of acting out and drama in the courtroom. I became very immersed in wanting to become a lawyer who represents people who are fighting injustice, and [in] working for people’s rights. I joined a group of lawyers—which I still am part of—called the People’s Law Office, which started in 1969 and is still going strong 45 years later. We represent people who are victims of police abuse and police brutality. We also are very involved in uncovering people who have been wrongfully convicted and have been in prison a long period of time. We’ve been able to free many people from prison. My first jury trial was on behalf of Black Panthers in southern Illinois who had been attacked by the police and shot back. They were acquitted of 47 counts of attempted murder. So that was a great way to start your legal career. Then what really influenced my commitment was the Attica prisoners’ rebellion, which happened in September of 1971. I was one of several lawyers who came from different places to represent the Attica prisoners who, by the time I got involved, had been beaten and a lot of them shot, and the prison retaken. We were trying to get them medical care and equal rights. The state of New York was willing to sacrifice its own guards, who were being held hostage, in order to put down this prison rebellion, even though it could have been negotiated. When they stormed the prison and shot—like a turkey shoot—they killed nine of the hostages. They originally said the hostages had died because their throats had been cut, and of course the coroner determined that they had all been killed by state police bullets. I helped to organize the legal defense of over 60 prisoners who were facing 1,400 felony counts. We organized a group called the Attica Brothers Legal Defense and I moved to Buffalo, New York, where it was based. I spent the next four or five years going back and forth from Chicago to Buffalo. Ultimately we brought a civil rights case on behalf of the [prisoners] who were killed and tortured after they took over the prison. I realized, working on the Attica case, how important it was to stand up for people in prison and how bad the conditions and treatment of prisoners were. That was really the cause of the Attica rebellion. I realized that I could walk away from these situations, but those people in prison or the people who were victims of injustice couldn’t. So I made a commitment that that was going to be my life’s work: to expose injustice and fight for equal rights of people. Q: What was the outcome of the Attica lawsuit? A: We won at trial for one of the prisoners for $4 million, then that was taken away by the Court of Appeals. But ultimately, we settled the case for $12 million for the victims of Attica. Q: Have any of your cases taken you before the U.S. Supreme Court? A: In 1980, I appeared in a case called Carlson v. Green, which was the case that established the right to sue directly under the Eighth Amendment for damages for cruel and unusual punishment. I represented a black man who died in a Terre Haute, Indiana, federal prison. He was the fourth man to die in the prison hospital within an eight-month period. This man was suffering from a terrible asthma attack; the doctor refused to come, even though he lived on the prison property. After several hours of him fighting for breath, the doctor said, “Give him some Thorazine.” That’s contraindicated for someone who’s having trouble breathing, and he died. We brought a case for cruel and unusual punishment—basically a denial of medical care. The government said, “You can’t bring a case directly under the Eighth Amendment; it doesn’t provide for a private cause of action.” That case established that right. It was 7-2. Q: What was it like arguing before the Supreme Court? Then the most interesting thing: Right in the middle of my argument, they bang the gavel and say, “It’s lunchtime.” So they get up and leave. Which is good, in a way, because then I had a whole lunch period to plan the rest of my argument. But it was so shocking. As soon it’s 12 o’clock, no matter what, they just bang the gavel and they get up and leave. A: Then-Chief Justice Warren Burger and Justice [William] Rehnquist. I recall that Justice Burger was very negative. Q: Was it an intimidating experience? A: The lead-up is intimidating: “I’m going to argue in front of the Supreme Court; they’re going to ask me a lot of questions. Am I going to do a good job?” But for me, I’m always very nervous whenever I go into court, no matter what. And I’ve been doing it for all these years. But as soon as I get in there and I lose myself in the struggle and I find a way to express my belief in my client and the issues in the case, nerves dissipate. I was fired up. Q: Any other cases that really stand out? A: A case that I’ve done on behalf of a prisoner in Indiana who was on death row and 30 days away from being executed. After many years of fighting for him, and winning once and losing once in the Indiana Supreme Court … they agreed to take the death penalty off the table, and he’ll be eligible for release in two years. He was a young black man who was accused of being involved in a bank robbery in which a police officer was killed. Q: You also worked for two decades, starting in 1975, on behalf of the Puerto Rican independence movement. A: I represented Puerto Rican political prisoners in U.S. courts and helped to obtain their freedom and clemency from President Jimmy Carter. I also represented Puerto Rican activists from Chicago and New York who were accused of being terrorists who were involved in clandestine work on behalf of independence. I have also testified before the U.N. decolonization committee and in other international tribunals in support of Puerto Rican independence. Q: What changes have you seen in our society over the years? A: One of the things that I’ve been involved with in the last 10 years is representing people accused of being terrorists. I’ve been representing Palestinian-Americans who have been accused of giving money to people in the occupied territories and charged with providing what they call material support for terrorism. [In] one of the cases I had in Chicago, two Palestinian men, who were from Chicago, were accused of RICO [racketeering and corruption] for being part of an organization in Palestine. [Prosecutors were] saying that was a racketeering-influenced organization. Of course, the jury didn’t buy that; after a long trial, they acquitted them of everything but minor charges. I’ve seen the courts used, in my view, to repress political activity; to over-punish people. I’ve been involved with a lot of work around the rights of prisoners and challenging high-security units. We brought lawsuits challenging keeping people locked up, basically being evaluated as threats to the institution and then being put in these units for indefinite periods of time—for two, three, four, five years in segregation. No way to get out, and no due process for getting in. I’ve done some work for animal rights people who have been involved in releasing minks and other animals that are in these fur farms and being treated very badly. And, of course, now they’re accused of terrorism. There’s a statute called the Animal Enterprise Terrorism Act which makes it a crime, a terrorist crime, to free animals or do any kind of protest about the treatment of animals that interferes with these industrial animal farms. They have been using RICO in political situations when it was supposed to be used only against organized crime, and that’s what they’ve used with terrorism too. They’ve expanded that use to use it against people who don’t fit the definition of terrorism. Just this year, I represented, with two other lawyers, these young men. My client was just 21 years old; he had come from Florida to be part of the anti-NATO demonstrations because the NATO summit was in Chicago this summer, and they were part of demonstrating and actually causing some kind of vandalism. They were found by these two undercover Chicago police who were encouraging them to take further steps beyond just minor vandalism and talking to them about making Molotov cocktails. Before they did anything—they never were able to do anything—they arrested them and charged them with terrorism. [In another] case, two young men are accused of freeing minks in Illinois and Iowa, and they’re charged with this Animal Enterprise Terrorism Act. It may be against the law, and maybe they can indict them, but why call it terrorism? I’ve found that, if you have a jury and you start talking about terrorism, either they’re going to see it and say, “Well, it’s really not terrorism,” like they said with those NATO kids, or they’re going to be influenced by that and not be able to really fairly look at the evidence. It’s a very prejudicial kind of charge. I’ve done a lot of work representing people who are subpoenaed to grand juries, and wrote a long law review article in 1984 that’s still being quoted by people who are opposing grand juries about how the power of the grand jury is being abused by the federal government—being usurped by federal prosecutors when the grand jury is supposed to be an independent institution. Q: Are you seeing a lot of repercussions from what’s going on with ISIS? A: The FBI is concerned that there are people who have gone from the U.S. over to fight with that group and other groups in Syria. The FBI is very active in terms of investigating and surveilling the Arab and Muslim communities in Chicago and in New York as well. I’m involved in a case right now in Detroit where a Palestinian woman, who’s 67 years old—lived in this country for 20 years—was arrested because they said 10 years ago when she filled out her naturalization papers, they asked her if she was ever arrested, convicted or imprisoned, and she filled out “no, no, no.” It turns out 45 years ago, in 1969 when she was a 22-year-old student, she was allegedly involved in resistance to the new occupation when the Israelis went into Gaza and the West Bank in 1967. She was put into a military tribunal that they set up, she was horrifically tortured, and she was found guilty of being involved in resistance activities against the Israel occupation. She’s been in this country 20 years. The reason, I believe, they brought these charges is because she’s very active in the Palestinian community in Chicago and part of the Arab American Action Network. We’re saying it’s politically motivated. Q: You are a past legal director of the Center for Constitutional Rights in New York. A: It was started [in 1966] by lawyers who were involved in the civil rights movement in the South. One of the founders was William Kunstler, who was a well-known civil rights lawyer; [also] Arthur Kinoy and others. They set up this office in New York, and over the years it’s expanded to be involved in international human rights, women’s rights, labor rights, all kinds of different work on behalf of people who are fighting for justice in the courts. From 1991 to 1996 I was fortunate enough to be the legal director of that institution. We had about 10 lawyers and we had a lot of cooperating lawyers who would donate their services to work on a civil rights case with the center. It’s still going strong; it was very involved in challenging the people who were put in Guantanamo and got some good opinions from the Supreme Court about that. I was involved in several cases when I was there. One that I was proud of was getting an injunction against preventing homeless people, who were getting harassed and beaten up in Penn Station. The police would see them as homeless and jump on them and throw them out. The court said they had a right to be there and to stop any type of abuse and harassment. Q: What do you like the best and least about your job? A: I like fighting for people’s rights and exposing injustice. Having to be creative about how to present people’s cases to juries, basically. The thing I like least is being in front of judges who are not open-minded and are basically so pro-prosecution or pro-government that they won’t listen to reasonable arguments. Q: What has changed in the legal arena since 1969? A: The law has become more restrictive and the judiciary has become more conservative. Of course, I came at the time of the Warren court. After Attica, there was a period of time in which courts were trying to give prisoners constitutional rights and protect their conditions and treatment. [Recently] we’ve seen a more conservative court, both in the federal district court level and, of course, in the Supreme Court. Also, I think we’ve seen a rollback on certain basic civil rights that were being protected when I first started practicing. Even in the criminal defense field, it’s much harder to defend people, and the law has restricted some of the rights of people who are accused of crimes. We have the influx of mandatory minimums and three-strikes laws. When Attica happened, there were 200,000 people in state and federal prisons—that was in 1971, 1972. Today we have like 2.5 million. This idea that we could somehow deal with crime by locking up more people for longer periods of time, that was the ethic that kind of took over—particularly the war on drugs and this idea that we needed to be harsher and [offer] less rehabilitation in prisons. Q: Do you see this trend continuing? A: The pendulum is starting to swing slowly back the other way—I think because of the financial problems that we’re experiencing. I don’t think there’s a strong sentiment among legislatures or judges that, “Oh, we’ve locked up too many people and we’re being too harsh.” But we’re spending too much money on prisons … and that’s what I think is causing the pendulum to slowly move back. The federal sentencing guidelines are not mandatory anymore—judges can look at them but they don’t have to follow them in federal court. That’s a good development. There are rulings by federal judges about keeping people locked up indefinitely in isolation units; they’re starting to say that mentally ill people shouldn’t be kept isolated. So there’s a beginning of some liberalizing or progressive movement, but it’s slow. The pendulum has swung so far the other way, it’s going to take a while to swing back. But I’m optimistic.